Dealmonger: #61-#80 Micro Drill Set Go Fast Or Save Gas? We’ve covered faucet lights that change color with water temperature before, but what’s even cooler about Sylvania’s ECOlight is that it provides both temperature indication and shower illumination without batteries or electrical wiring — water pressure provides the power for this self-contained unit. The ECOlight has an LED that glows blue when the water is cold and red when the water gets warmer. It uses Sylvania’s high power golden dragon LED to provide light so you don’t need to turn on any extra lights on when you’re showering. There’s an on/off switch if you don’t want to use the light. 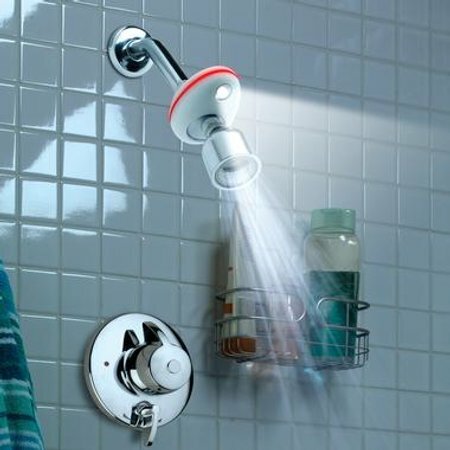 The ECOlight body and the shower head can pivot up and down and left and right. You can install the ECOlight in any shower or other fixture with 3/4″ standard shower pipes. Pricing for the ECOlight starts at $20. Looks like the light points downward, I was hoping to aim it upwards… …to bounce the light off the mirrored disco ball. Just what i always wanted,a light to light up the work area in the shower. It also tells me if i am either going to freeze it or burn it. It nice to light up the area i am cleaning.